If you want to skip to the free coupon for Planner Pads, scroll to the bottom of the post. I’m going to talk about my favorite two options for organization, the top one being the free app Week Plan. I stumbled across Week Plan a few months ago while searching for an alternative to google calendar. My problem was the format. I don’t work or think in hours and time slots, unless I have an appointment to meet, I generally work within a series of to-dos, but every calendar I came across asked me to organize via time schedules. Organized by sections like “family”, “friends”, “work”, “personal”, with this calendar you make sure you don’t forget anything. On other calendars, I would list out my work tasks, forgetting that I wanted to skype with my friends or cook dinner for family or even lose a pound or two. These sections make sure your goals are well rounded, and more personal. I had a similar system in my agenda, but when I left a task undone, I would often end up forgetting about it, or coming back to it “when I had time”. This calendar will shame you into getting your work done. Each day that you don’t finish a task, it is automatically moved to the next day with a small arrow and the number of days it has been procrastinated. Try to get to arrow three without feeling guilty. You won’t. This calendar has been the push I need to get the small tasks done, while still focused on the big goal. You don’t just list your weekly goals on this calendar. There is a section called “envision”, where you can write your mission statement, your values, your long term goals, and your achievements. In conjunction with the journaling piece of the calendar, this serves to keep you on track towards bigger ideas while focusing on the small ones. 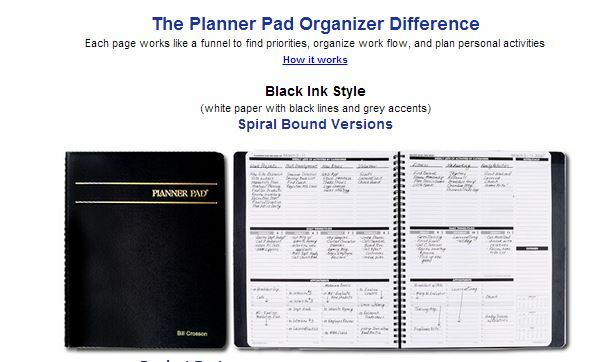 Now if you’re a pen and paper kind of person (much better in my opinion for managing right brains), or you just need something that doesn’t require internet, try the $30 equivalent of Week Plan called Planner Pads. These things are great. They’re divided into three sections. Section one is for weekly goals, broken down by category just like Week Plan. Section two is the daily plan section. And section three is a timetable, so that you can plan your appointments. Here’s what it looks like. And another review with a FREE COUPON: http://www.barbarahemphill.com/personal-productivity/159-planner-pad-my-calendar-of-choice. Try these options for organizing your life! You’ll be glad you did. This entry was posted in getsmART and tagged amber lee, amber t lee, animation, design, originelle, originelle design and production, production company, virginia, washington dc, writing. Bookmark the permalink. WERK!!! Eight songs to get you pumped for business.